Search our large selection of Russian Cut Diamonds. Cut is the factor that fuels a diamond’s fire, sparkle and brilliance. The traditional 58 facets in a round brilliant diamond, each precisely cut and defined, are as small as two millimeters in diameter. 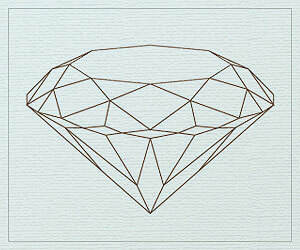 But without this precision, a diamond wouldn’t be nearly as beautiful. The allure of a particular diamond depends more on cut than on anything else. Brilliance — The total light reflected from a diamond. Fire — The dispersion of light into the colors of the spectrum. Scintillation — The flashes of light, or sparkle, when a diamond is moved. As a value factor, though, cut refers to a diamond’s proportions, symmetry and polish. The width and depth can have an effect on how light travels within the diamond, and how it exits in the form of brilliance. Light is lost out the bottom causing the diamond to lose brilliance. Light escapes out the sides causing the diamond to appear dark and dull. However, the cut grade of the diamond goes beyond simple measurements of width and depth. 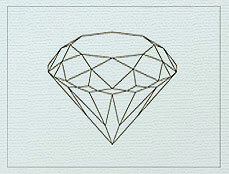 The proportions of a diamond refer to the relationships between table size, crown angle and pavilion depth. A wide range of proportion combinations are possible, and these ultimately affect the stone’s interaction with light. Diameter — The width of the diamond as measured through the girdle. Table — The largest facet of a gemstone. Crown — The top portion of a diamond extending from the girdle to the table. Girdle — The intersection of the crown and pavilion which defines the perimeter of the diamond. 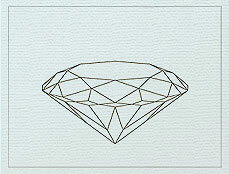 Pavilion — The bottom portion of a diamond, extending from the girdle to the culet. Culet — The facet at the tip of a gemstone. The preferred culet is not visible with the unaided eye (graded "none" or "small"). Depth — The height of a gemstone measured from the culet to the table. Polish and symmetry are two important aspects of the cutting process. The polish grade describes the smoothness of the diamond's facets, and the symmetry grade refers to alignment of the facets. With poor polish, the surface of a facet can be dulled, and may create blurred or dulled sparkle. With poor symmetry, light can be misdirected as it enters and exits the diamond. The polish and symmetry grades are clearly listed in each diamond detail page and within the diamond grading report. For the most beautiful diamond, look for a symmetry grade of good or better. For more than a decade, Russia has been known as the premier diamond cutter. Russian-cut is an ideal- cut diamond that has 58 facets, with excellent proportion and symmetry. Each Tiffany Jones Designs diamond is produced within exact specifications and carefully hand-faceted by an expert cutter. We take great pride in the cut of our diamonds, and are willing to sacrifice weight to achieve the ideal cut so as to maximize the jewel’s brilliance. These impeccably cut stones have fire and luster unparalleled in the diamond industry. Diamonds from these sources are of the finest makes in the world. Diamond cutters usually decide to sacrifice some beauty to make a heavier diamond and as a result less than 3% of diamonds are cut to ideal proportions. 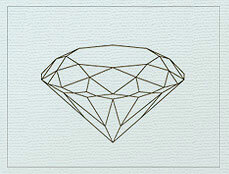 Tiffany Jones Designs is proud to offer the largest selection of ideal cut clarity enhanced diamonds. We do not carry diamonds with cut grades lower than fair, which are generally either too shallow or too deep to present an acceptable amount of brilliance. Tiffany Jones Designs carries the largest selection of Russian Cut (Ideal-cut) diamonds.